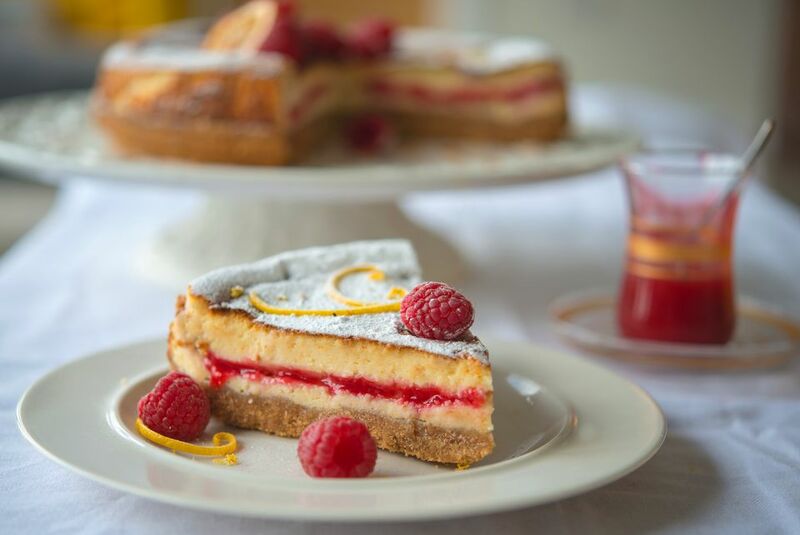 If you want to bring some serious wow factor to your dessert table, then look no further than this lemon raspberry cheesecake. With its superb contrasting textures—between the filling and the crunchy base—the sharp tang of lemon, balanced with the sweetness of the raspberries, this baked cheesecake is so, so exciting and it will fast become a family favorite. Feel free to ring the changes on this one if you prefer; lemon and raspberry are the perfect combinations, but how about something a little tropical, like lime and mango perhaps? Thoroughly mix the cracker crumbs with the melted butter and sugar. Press the mixture into the bottom of a 9-inch springform pan. Press with the palm of your hand to firm up the base, then bake for 10 minutes in the preheated oven. Once cooked, leave the base to cool completely. Place all the sauce ingredients into a small saucepan, bring to a gentle boil, then lower the heat and cook for 5 minutes. Press the raspberries with the back of a fork to break up the fruit. Push the sauce through a fine sieve to create a smooth, thick sauce. Put to one side. In a large bowl, beat together the cream cheese, sugar, lemon juice, zest, and eggs to create a thick, smooth batter. Pour half of the cream over the biscuit crumb. Drizzle over the raspberry sauce then very carefully, ladle over the remaining cream trying to avoid disturbing the raspberry sauce too much. Place the cake in the center of the hot oven and bake for 50 minutes. The cake will turn a delicious golden brown. Once cooked take the cheesecake from the oven and leave it to cool completely. Wrap the cheesecake in paper or place into an airtight box and refrigerate for 2 hours (or overnight if possible). Do not try to cut the cake before then, as the base will crumble and the topping will fall apart. When ready to serve, drench with the powdered sugar, a few strands of lemon zest for decoration, and a little extra raspberry sauce on the side, if you have any left. Note: The cheesecake is best eaten fresh and will keep for a few days well wrapped in paper or in an airtight box in the refrigerator. Bring the cheesecake back to room temperature before eating, as the flavors will be so much better for this.